As the role of the physical therapist widens to include more primary care and diagnostic responsibilities, there is a greater need for a single, up-to-date resource that explores professional roles and developments in this changing field. This new book is the definitive reference on this important topic. This concise book provides information on every vital area important to professionalism: documentation, law and ethics, and leadership - all in the context of the five roles of the physical therapist as defined by the APTA's Guide to Physical Therapist Practice, 2nd Edition. 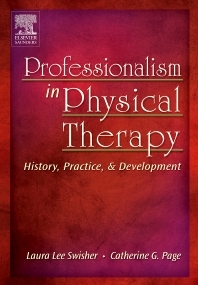 Readers will find information on the history of professionalism in physical therapy, the five roles of the physical therapist (Patient/Client Manager, Consultant, Critical Inquirer, Educator, and Administrator), the role of the physical therapist in today's health care system, and professional leadership and development. Case studies, "how to lists" and "tips from the field" encourage critical thinking and provide strategies for various issues. The book also offers tips on preparing a portfolio, determining leadership style, and preparing a professional development plan based on the APTA's five roles.